PHUKET CITY: The popular Siam Indigo Exotique Bar and Restaurant on Phang Nga Road was partially damaged in a fire that broke out at about 10:20 am yesterday. 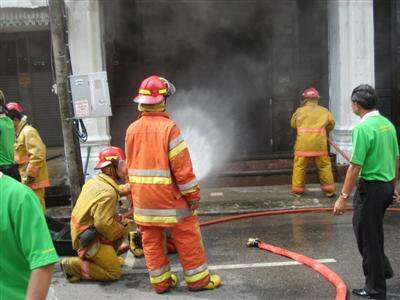 Taweesak Suwit, an officer at the local Department of Disaster Prevention and Mitigation (DDPM-Phuket) office, told the Gazette that two Phuket City fire trucks managed to get the blaze under control, though more trucks were waiting on standby in case the blaze spread. In total, six firetrucks with 15,000 liters of water each and 36 firefighters helped to get the fire extinguished in about 10 minutes. The restaurant and bar occupies three shophouse units, built about 80 years ago, near the K-bank Phuket main branch in what is now known as Old Phuket Town. Officials think the fire started behind the bar counter and spread into the hall. Phuket City Police Superintendent Wanchai Ekpornpit said that an electrical short is thought to have been the cause of the fire, but that the police are waiting for forensics investigators to submit their report. The actual damage was probably far less than the 1 million baht reported by some media outlets, he said.